Morphologic image processing is effective for identifying the parts of an axial CT image that represent a patient's body. 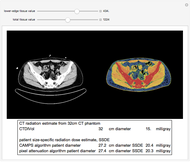 This Demonstration uses axial CT images obtained from a publicly available database on the National Institutes of Health website as examples for calculating radiation exposure. The image is a CT slice through the pelvis. Computed tomography dose index calibrated for a specified volume (CTDIvol) and size-specific dose estimate (SSDE) are measures of radiation exposure associated with a CT exam. The SSDE provides a better estimate of radiation exposure to the patient. Two methods of calculating SSDE are included in this Demonstration: CAMPS and pixel attenuation. The text boxes display two measures of radiation exposure during a CT exam. The computed tomography dose index for a defined volume (CTDIvol) is based on measurements by radiation dosimeters placed in a plastic disc simulating the human body (a CT phantom). The CTDIvol can be used to compare the radiation exposure between different CT machines. 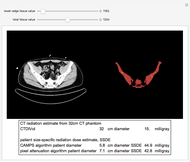 The size-specific dose estimate (SSDE) is calculated from adjusting the CTDIvol for the size of the patient relative to the size of the standard CT phantom. The SSDE is a better estimate of radiation exposure to a patient undergoing a CT exam. The unit of measurement for both the CTDIvol and SSDE is milligrays. The first task in calculating SSDE radiation exposure from a CT exam is to correctly identify the body in the CT image. The correct classification of image pixels as part of the body or external to the body is feasible with morphologic image processing. In this case, MorphologicalBinarize is the primary function used. The sliders allow varying the two pixel value parameters passed to the MorphologicalBinarize function. Structures in the image that are external to the patient may be eliminated by the choice of the two pixel value parameters and by the subsequent DeleteSmallComponents function. The binary images provide feedback on the success of classifying the image pixels as part of the body or external to the body. The lower-edge tissue value setting is more significant than the starting tissue value. After classification of the image pixels into the body and nonbody pixels, the cross-sectional body area may be calculated. 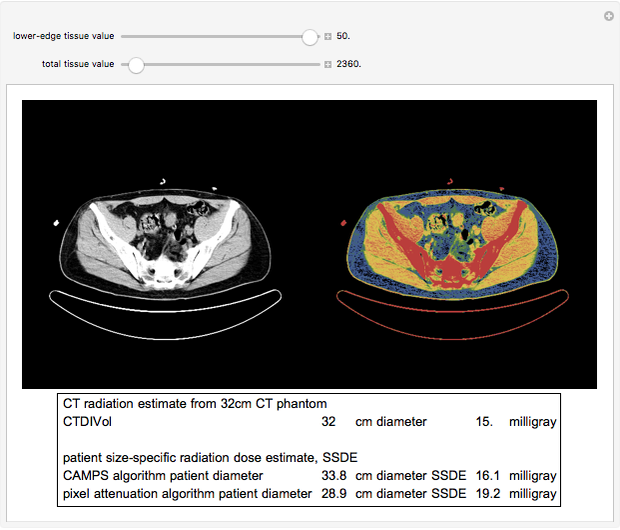 The SSDE calculated by computer-assisted measurement of patient size (CAMPS) then calculates the SSDE from the area of the body pixels. The SSDE calculated by pixel attenuation adjusts the area of each body pixel by the pixel attenuation value. The pixel attenuation algorithm is a more rigorous calculation of SSDE. The CAMPS algorithm is faster to compute. The image selected is a CT slice in the pelvis. Variation in calculated SSDE between the CAMPS algorithm and pixel attenuation algorithm is related to the amount of body fat, bone or lung tissue in the CT slice. In the selected CT slice, the amount of bone included in the image (red-orange in the colorized image) results in a slightly higher estimate of diameter by the pixel attenuation algorithm. The snapshots show the effect of variations in the image processing parameters on the identification of body pixels (denoted by the color) and the subsequent calculation of SSDE. There is a fairly wide setting of the lower tissue value that effectively eliminates the CT table and clothing snaps from the body pixels. Setting the lower-edge tissue value too high will leave only the bone as the identified body pixels. Setting the tissue value does not have much visual effect on the processing in this CT image because structures outside of the body have high pixel values (metal snaps and the CT table). On the other CT images (in which clothing with metal snaps has been removed), setting the tissue value to the level of bone pixel values will eliminate many external structures, such as the low pixel values associated with cloth gowns or foam pads. This Demonstration has been developed as supporting education material for a report that has been submitted to The Journal of Applied Clinical Medical Physics. This Demonstration uses images available from the NIH website . AAPM Task Group 220, "Use of Water Equivalent Diameter for Calculating Patient Size and Size-Specific Dose Estimates (SSDE) in CT," College Park, Md: American Association of Physicists in Medicine, 2014. aapm.org/pubs/reports/RPT_220.pdf. AAPM Task Group 204, "Size-Specific Dose Estimates (SSDE) in Pediatric and Adult Body CT Examinations," College Park, Md: American Association of Physicists in Medicine, 2011. aapm.org/pubs/reports/RPT_204.pdf. R. C. Gonzalez and R. E. Woods, Digital Image Processing, New York: Pearson Publishing, 2018, Chapter 9, Morphological Image Processing. J. M. Boone, W. R. Hendee, M. F. McNitt-Gray and S. E. Seltzer, "Radiation Exposure from CT Scans: How to Close Our Knowledge Gaps, Monitor and Safeguard Exposure—Proceedings and Recommendations of the Radiation Dose Summit, Sponsored by NIBIB, February 24–25, 2011," Radiology, 265(2), 2012 pp. 544–554. doi:10.1148/radiol.12112201. National Biomedical Imaging Archive. (Sept 21, 2018) imaging.nci.nih.gov/ncia/login.jsf. John M. Bramble "Processing CT Images with Morphologic Algorithms"